But anyway, back to the list for this day. Guinea fowl is something we can't get here, or at least certainly not in February, so I substituted duck breast. And what goes with a nice duck breast? Why, fries/chips/frites of course. (In the U.S. they are called fries, in the U.K. chips, and here-ish they are frites.) This is a mix of sweet potatoes, parsnips, and regular white potatoes. 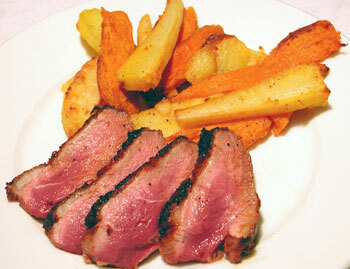 The sweetness of the sweet potatoes and parsnips goes very well with the duck. This is my favorite way to make fries - not deep fried, but in the oven. With butter, or olive oil. The types of oil that have a high enough flash point to be used as frying oil, such as peanut or safflower oil, don't really add any flavor, but butter and olive oil certainly do. The only thing to be aware of is that regular white potatoes take a bit longer to cook than sweet potatoes or parsnips, so they are parboiled. This also roughens up the surface of the potato a bit, making it more crunchy. The duck breast really cooks fast, so you will want to start it off about 15 minutes before the end of your target cooking time. It will take about 5 minutes on the skin side, 3-4 minutes on the other side, then the rest of the time is for 'resting' - leaving the succulent breast lying there to relax and re-absorb its juices before slicing. Maple syrup is sweet but has other flavors in it so that it's not just sugary taste hitting you. It makes a really great glaze. I have used a grill pan for this - this is the kind of pan with ridges on the bottom. It's really terrific for grilling, since barely anything sticks to it. If you don't have one, you can use a nonstick frying pan. Unused ingredients: cheese, bacon, penne. The verdict on this meal from an anonymous diner: "Plate-licking good!" The amounts here will make two servings. Switch the oven on right away to heat it up. Peel your vegetables, and slice. Toss the potato in to the boiling water and cook for about 5 minutes. Toss the vegetables in the butter. Spread on the baking sheet and season with salt and pepper. Set your oven timer to 25 minutes. Prepare the duck, while heating up your grill pan. Rest the duck, while you take out the oven fries. Slice the duck, assemble the plate. Start a pot of water boiling, with a little salt. Peel and slice the vegetables into french-fry/chip/frites size, keeping each kind separate. Put the white potato slices into the boiling water, and cook for about 5 minutes. In the meantime, melt the butter in a pan. Line a baking sheet with a non-stick silicon pad. Spread evenly on the baking sheet, and bake in the oven for 25-30 minutes, turning them about midway through. Dry the duck breast with several paper towels if necessary. Score the skin in a crisscross pattern with a very sharp knife. This is to release more fat from the skin, which also makes it crispier. Heat up the grill pan until it's very hot. Place the duck, skin side down, on the grill pan. Salt and pepper the exposed side. Don't move the duck for at least 5 minutes. At that point, take a look at the underside - it should be golden brown but not charred. Flip the duck. Take the breast off the heat and let rest for at least 5 minutes. Slice thinly, and serve. Submitted by maki on 2006-02-13 15:56. Maki, I love your blog! The photos are so wonderful. It's such a treat to come home feeling tired greeted by stunning pictures of your cooking. Thought I'd let you know how happy reading your blog makes me feel. I admire you for undertaking the MasterChef challenge and producing excellent results. wow, thanks for your kind words, and I'm glad you enjoy my site! Hi there. I think gammon is ham - just plain old boiled ham. that sells British-style pork products. Their explanations are pretty good - except that I couldn't find any bacon that resembled USA-style strips of thin bacon, which we get from the Migros (too salty) and Coop, in Switzerland. My experience with bacon in the UK is that it's the big thick pieces shown on the site above, and it's hard there to find strips. I've had gammon steaks prepared several ways and always found them much drier (often thicker) than most hams. Ellen: so, gammon looks kind of like Buurehamme ... which is available at Migros, and many other places. I've never had fries with duck before, so to me that actually seems odd! It looks like a fantastic combo, though. Of all of the masterchef ingredients, this one seemed to be the easiest to incorporate all of them into a dinner if you so chose.